In areas where sun strokes severely strike in summers, a glass of chilled buttermilk is always a blessing. So, are you fond of buttermilk? It is the coolest and healthiest summer drink -- commonly found in households and drunk daily. Buttermilk is prepared using fresh curd. Some people also add pepper and green chilies, along with cumin powder and black salt while preparing chaas. In ayurveda, buttermilk is known to maintain health and to help fight against diseases. You might have heard, one glass of buttermilk daily will cure all your digestive problems such as gastric issues. 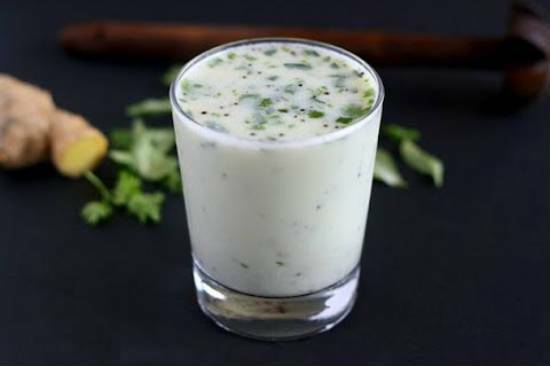 Buttermilk is easy to digest and a natural cure for upset stomach, spleen maladies, anaemia and lack of appetite. Buttermilk should be generally consumed after a meal. Sometimes, we feel we have eaten in excess. Then you must try a small glass of this beverage. It is very effective in making your stomach calm and washing down the oil or ghee that is accumulated in the inner walls of your stomach. As per US National Institute of Health, bacteria present in buttermilk are effective in keeping your cholesterol levels under control. Buttermilk is loaded with numerous health benefits – it is a great source of vitamin B, protein, and potassium. It is rich in calcium and is perfect to include in your daily diet. Did you know buttermilk is used for skin care also? Regular use of buttermilk helps tighten the skin and makes it wrinkle-free and young. Say no to artificial treatments and include buttermilk in your diet. Aren’t you amazed with the benefits of this healthy, refreshing drink which lowers your body heat? Boost your immune system with a glass of refreshing chaas. We have a quick and soothing buttermilk recipe for you! Have a look. If you have a passion for cooking and love trying new recipes, click here to learn more. Spread magic with your culinary skills right now!